Delicious with an herbal character. Tasty mild Dutch cheese with a hint of garlic. 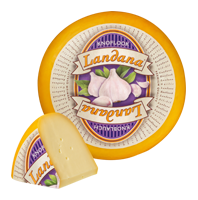 Landana GARLIC is ideal for cooking. Lactose (<0,1g/100g) and gluten free. Contains vegetarian rennet.